TToT has been an ongoing weekly blog hop since June of 2013, and many people have taken up the challenge to join in and share their own reasons to be thankful. Lizzi has done an amazing job of hosting TToT for the past three-and-a-half years, with the support of an awesome group of co-hosts, and she is ready for a well-deserved break. She has graciously allowed Josie Two Shoes to take on the role of TToT administrator and move TToT to its very own blog address here. 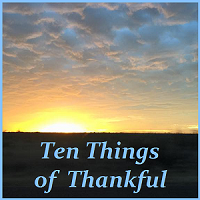 TToT also has a private Facebook page at Ten Things of Thankful.